What is PREP (Piscataqua Region Estuary Partnership)? Every 5 years PREP (Piscataqua Region Estuary Partnership) releases a comprehensive report detailing the health of our home waters. The Piscataqua Region Estuary is made up of 52 communities in New Hampshire and Maine, covering about 1,086 square miles of coastal shoreline, bays, businesses, forests, rivers, streams, roads, lakes, salt marshes, residences, flats, etc. This area is home to whitetail deer, owls, hawks, bald eagles, countless species of ducks, songbirds and woodpeckers, foxes, racoons, big eastern coyotes, moose and even bear. Seals, whales, porpoises, striped bass, spearing, herring, sandeels, lampreys, mackerel, smelt, oysters, mussels, clams and menhaden only scratch the surface of the biodiversity that lays beneath the water's surface. PREP works diligently to protect and improve the system's water quality and has been doing so for the last 22 years. With over 150 organizations and individuals across 52 communities, PREP helps transform complex scientific data into an actionable plan for protection and restoration of our watershed. We have an abundance of animals, humans, and marine life all cohabitating together in a very sensitive ecosystem. Water is the lifeblood that connects every inch of the drainage. That means each ounce of wastewater, fertilizer, agricultural waste, and other contaminants that permeate into our estuary can have a profound impact on the overall health and resilience of the system. Health is measured a number of ways and we have lots of indicators in our system that act as the canary in the coal mine. Demand for infrastructure including new homes, businesses, roads, etc. New buildings create more impermeable structures in our system which compromises the land's natural ability to filter the water. The result is more stormwater and sediment runoff causing an increase in nutrient loading and ultimately more pressure on the downstream estuary. Nutrient loading is a big issue and nitrogen is the major concern. Nitrogen is a good thing at the right level but too much of this element causes excessive growth of seaweed and phytoplankton. Too much seaweed and phytoplankton can suffocate the system causing a decrease in dissolved oxygen which affects sediment quality, seagrass, shellfish, benthic invertebrates, and fish. How Does Our Estuary Respond to Stress? Oyster populations have fallen from 25 million in 1999 to 1.2 million in 2000. Oysters in Great Bay filter around 20 gallons of water a day. A decrease in our natural filters has far reaching implications. Oysters have been on the rise the past couple years in Great Bay and currently numbers hover just under 2 million. More oysters means more filtered water in our system, reducing TSS (total suspended solids). Eelgrass in Great Bay is on the decline and has shown a lack of recovery after high stress events. Eelgrass is a key health indicator. It allows suspended solids to settle, absorbs nutrients from the estuaries soil, creates habitat for fish and shellfish, and provides key organic matter for the bottom of the food chain. Clams are in rough shape in the Hampton-Seabrook Estuary. They have been on the decline for most years since 1997. Clams have become more susceptible to disease as water quality deteriorates. What Are We Doing to Fix the Problem? Increasing the amount of land in conservation is combating the growing rise in impermeable surfaces. Responsible development of new construction. Certain geographic locations are much more sensitive than others. We can plan our communities responsibly and help to minimize our impact. Municipalities have invested hundreds of millions of dollars to update wastewater treatment systems which has an immediate impact on our water quality and nutrient loading. We've made great progress with room to improve, particularly in Portsmouth, NH, over the coming years. 30 communities in the system are updating stormwater policies to positively impact the estuary. Piscataqua region residents are making an impact through their everyday choices. Here is a great link to explore how you can lower your impact everyday: Citizen's Guide. We have never had a more talented group of organizations and individuals committed to the protection and restoration of our estuaries. Click here to volunteer. As of 2016, 42% of the historical distribution for river herring has been restored, including the removal of the Great Dam in Exeter, NH. PREP's goal is 50% of historical distribution which feels attainable. This is great for our herring populations. How Does This Effect Stripers?! Stripers are intimately weaved into the fabric of our estuaries. 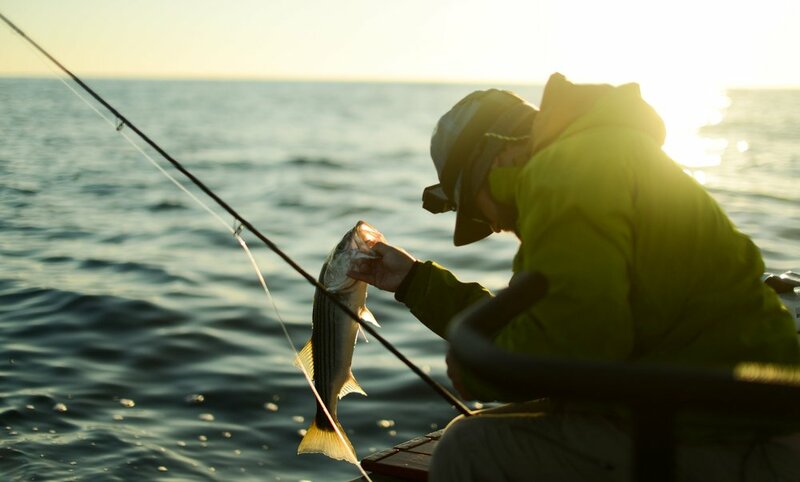 The food chain connects the smallest of organisms to our beloved stripers and everything in between. Any change in the system affects these fish. Bass require water within a specific temperature range, toxicity level, dissolved oxygen range, and the list goes on. Our affect on the estuary, as humans, has put this great fish at risk. It's imperative that we take care of our estuaries if we want to take care of the striped bass. If we all continue to care and make small adjustments to living a less impactful life on our natural environment, that's a great start. Get to know the estuary, take a sunrise walk in the Rachel Carson Wildlife Refuge, explore the trails around Great Bay and tap into the natural rhythms. Go catch and release a striper or just peacefully watch the kingfishers dive into Chauncey Creek. Your connection to the estuary to crucial, the more people that love this place the better.